I was fortunate enough to receive accreditation and attend EPT to cover the event. It was my first ever major poker event and my chance to see close up some of the world’s greatest players. And seeing that the whole experience was a total assault on the senses – and suiting my completist’s love for classification – I thought that I would detail a few reminiscences accordingly. So, poker players, here is my EPT version of the 5 poker senses…. It’s the first thing I noticed although couldn’t work out what it was exactly for a couple of days. And no, I don’t just mean the overwhelming smell of testosterone soaked adrenalin raised raw power infused sweat…and that was just coming from the massage ladies. No rather, it was a somewhat more delicate fragrance that hung in the air which my sensitive schnozz detected and then grew to love. A sort of artificial yet fresh smell which seemed to come in waves. And then it hit me – it was the combination of new packs of cards and chips being broken open and riffled at each table. Surely for a player nothing but poker pheronomes?! Ok, a bit strange but hey, I’m one of those weirdos who spends a slightly too long amount of time sniffing new books so I guess no surprise there. This obviously links to the previous sense and is something that everyone remarks upon on their first visit to any relatively large scale poker tournament. The sound of chips being riffled is instantly familar from TV but magnified to a louder yet strangely soothing level. And it might sound like a bizarre comparison – but then I do love a quirky tangent! – but it reminded me of accounts of visitors to medieval monasteries where the first sound they would hear as they walked through the cloisters was that of the monks murmuring and whispering in their cells as they read aloud the scriptures and prayers. Each individual susurration combining to create a chorus like that of birds in the forest. And when was the last time you heard poker players being compared to medieval monks eh? Well, apart from the stunning sight of table after table filling up the grand ballrooms of the venue with 100s of poker players, there’s of course that thrill of seeing one’s poker heroes strolling by, chewing on a burger, smoking a fag, snogging…oh wait, I’ll draw a discreet veil over that last one.. But this is probably a good time to make some confessions about a couple of poker faux pas that I managed to commit. Although I tend to be very good with faces, names often escape me. And there were a couple of times when a complete brain fuzz descended. So my apologies to Jamie Sykes to whom my initial greeting was, “Are you Norwegian?” which is not as strange as you would think considering the strong Norwegian takeover of the bar at that time. But even more embarrassing than that was standing outside the venue with a couple of Kevin Killeen’s entourage and assuming that the very charming preppy looking young american who came up was probably just a visiting student at LSE or something equally academic. Rather than being Ike Haxton stepping down from Poker’s Mount Olympus. Then again, in my defence half of the young men who play at EPT look like they’re preppy types from Ivy League universities. While the other half look like they stole the lunch money of the preppy types from Ivy League universities…..
No, I’m not returning to the snogging theme…I’ll wait for the late night version post watershed version of the blog for that. Rather, I”m thinking of touch in a much more general and I hasten to add, platonic way. The camaraderie, the conviviality, the mutual celebrations and commiserations. Connections were made and strengthened with people who perhaps had only been known online until that point. And new friendships were established. Actually no! Well, yes. But not just snog. Talk, interact, communicate. Be!! I had a great conversation about this with Howard Swains of Pokerstars Blog fame. About how coming to EPT reminded me that the relationship between online and live forms of poker is much more fluid and less distinct than I had originally assumed. I am the classic recreational player that forms I guess the main bulk of your average Pokerstars customer base. By no means a professional but hopefully striving to improve my game. And online has given me the freedom and security to learn, explore and make a ton of mistakes without too much fear or embarrassment. Apart from a couple of trashtalkers in the chatbox but which unlike IRL,are easily deleted. But EPT reminded me that poker is – as it always was since the dawn of its creation – a social game. Duh! Who knew? Talk about stating the bleeding obvious! But actually really easy to forget when sitting in the comfort of your room clicking away and seeing avatars instead of fellow human beings. So when I sat down at my first ever tournament last week, the sensation was that of utter bewilderment and at times sheer panic. Where’s my mouse?! Who are all these people sitting in my room? Where is my screen?! Why am I not in my underpants?…. Thankfully – for all concerned – I resisted the temptation to make myself suitably comfortable…. 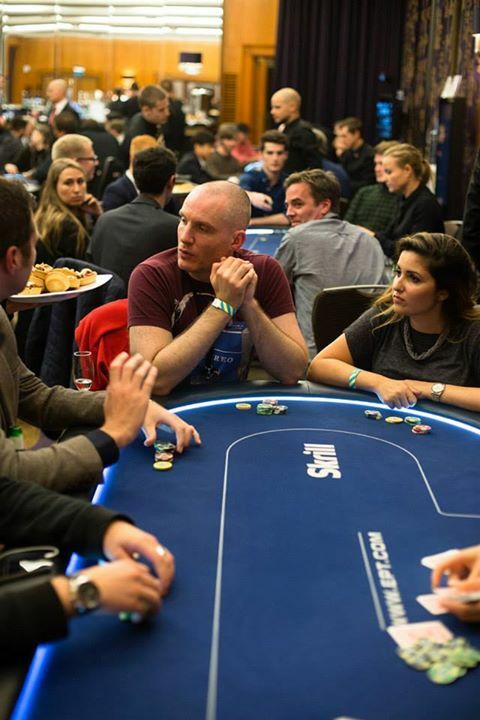 But even without playing a hand, just walking around and seeing the interaction of players and the palpable energy in the room showed how poker offers us all so much more than the virtual. Indeed, there is more truth in the old PS strapline than I ever imagined. Yes, we really are poker! Instead let’s finish back at the EPT bar where I spent many a happy hour over the course of the event. And not just drink! I will not forget the wonderful evening of drinks and canapes laid on by Alexandre Dreyfus and his splendid team at GPI talking about the sportification of poker. There are many exciting developments ahead for poker which no doubt will be of great interest to players of all levels. Oh how good poker tastes! As usual a delight to read your stories! Fantastic insight on a very interesting world.